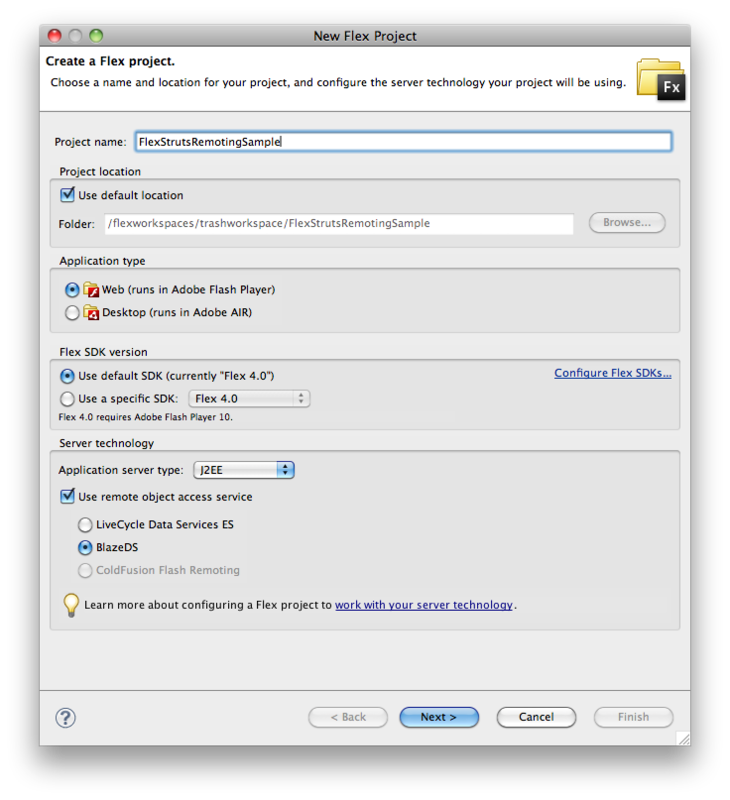 This article explains how to add Adobe Flex front end to Java + Struts web application. In this article we will be using BlazeDS Remoting service to communicate with the server from Flex application. Sample application in this article uses Flex 4, Struts 2.1.8 and BlazeDS 4. First lets have a look at Java + Struts web application which uses HTML to display the data. I have a web application called flexstrutssample created in which I have the following files. The SimpleCustomerService class has methods to communicate with Database and perform CRUD operations on the Customer table. In this article we will use the getAllCustomers() method in SimpleCustomerService class, which returns all the SimpleCustomer entries in the database. The CustomerAction class extends from ActionSupport class. CustomerAction class invokes the getAllCustomers() method in SimpleCustomerService class and returns Action.SUCCESS. In Struts configuration file (struts.xml) we have the result “success” mapped to list.jsp for the action with name=”list”. 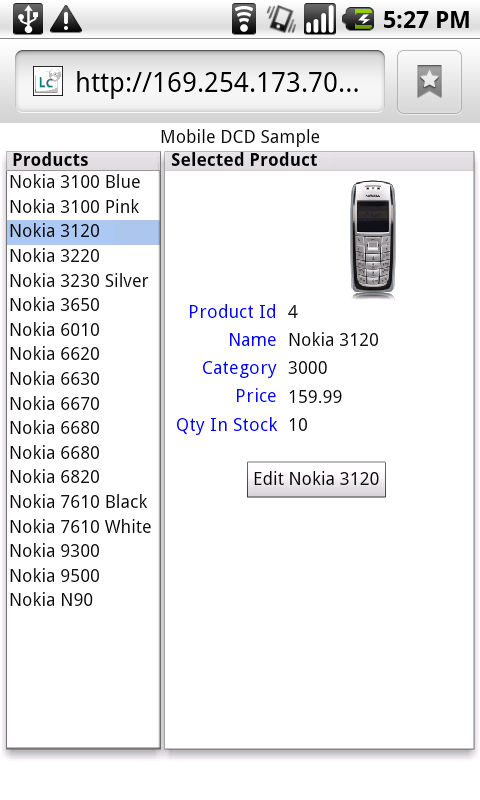 The list.jsp file accesses the list of customers from the simpleCustomers variable and renders the same in a HTML table as shown in the image below. 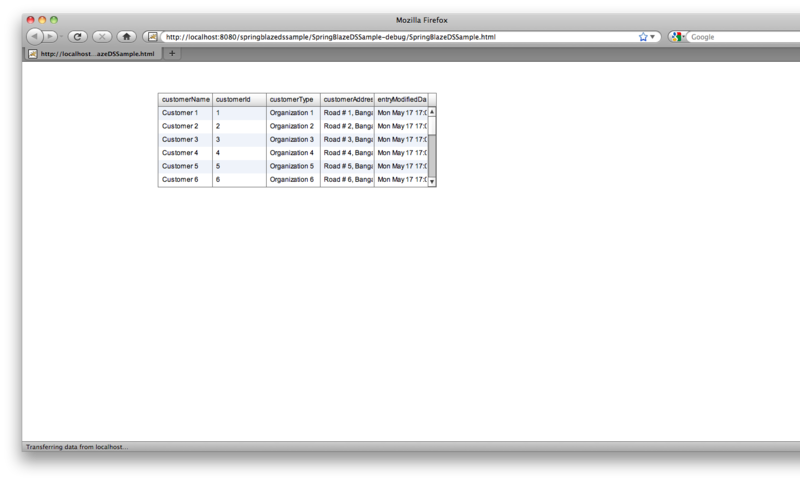 We have a simple web application that fetches records from database and displays the records in a HTML table. If you are using Rich Internet Applications (RIA) framework like Flex as front end for your applications, you can use rich and interactive controls like DataGrid. If you observe list.jsp is returning HTML, so that browser will render the data in a table. Since we will be using Adobe Flex framework to create the user interface for the application, we don’t have to return HTML from the server; All we need to return from the server is the data that needs to be displayed to the user. Alternatively you can chose to use Flex Remoting. Using Flex Remoting you can invoke methods in native Java classes on the server and the data is transferred in AMF format. If you use Flex Remoting, you don’t have to create an additional JSP/Servlet to represent the data in text-based format. For using Flex Remoting you need libraries like BlazeDS on the server, so lets deploy BlazeDS jar files and expose the SimpleCustomerService class as Remoting service. Download release build of BlazeDS. BlazeDS release builds are available at this URL http://opensource.adobe.com/wiki/display/blazeds/Release+Builds Click on “Download the BlazeDS binary distribution” to download the binary distribution. Binary distribution has just jar files and other configuration files required. In the blazeds-bin-4.0.0.14931 folder you will find a file named blazeds.war and blazeds-bin-readme.htm. blazeds-bin-readme.htm contains terms and conditions and license details. blazeds.war contains required jar files and configuration files for setting up BlazeDS. Extract the content in blazeds.war file into a folder called blazeds. You can try renaming the file to blazeds.zip and extract the contents using tools like winzip. This folder (blazeds/WEB-INF/flex) contains BlazeDS configuration files. Use these files to configure Remoting/Messaging/Proxy services. Now we will add Servlet mapping for BlazeDS Servlet named MessageBrokerServlet, so that BlazeDS is invoked when you send request for a Remoting/Messaging/Proxy destination using any of the channels supported. After setting up BlazeDS, you have to enable RDSDisptachServlet, which is used by Flash Builder 4 to get destination details. Copy the Servlet URL mapping and declaration below and add to your web application web.xml file. To invoke public methods in a Java class from Flex application, you need expose the Java class as Remoting service destination. Remoting service destinations are configured in a XML file named remoting-config.xml, which can found in flexstrutssample/WEB-INF/flex folder. Add the highlighted text below to the remoting-config.xml file. We created a Remoting destination whose id is CustomerService, which is mapped to SimpleCustomerService class. In the steps below we will see how to invoke methods in SimpleCustomerService class from Flex application, rather we will see how to consume Remoting services from Flex applications. Set the Root URL to root URL of your BlazeDS enabled web application. Its http://localhost:8080/flexstrutssample in this sample. Set the Context root to context root of your BlazeDS enabled web application. Its /flexstrutssample in this sample. 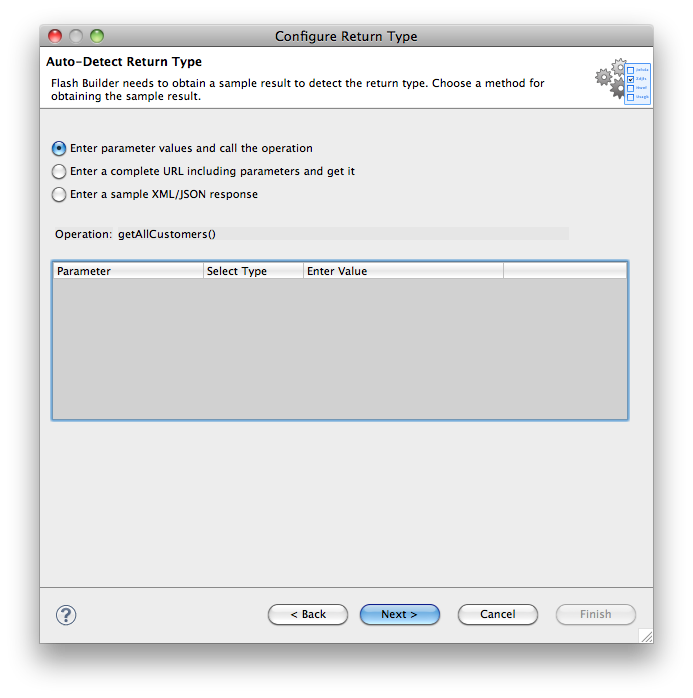 Click on validate configuration button to check if the values are properly configured. You should see a message at the top saying web root folder and root URL are valid. 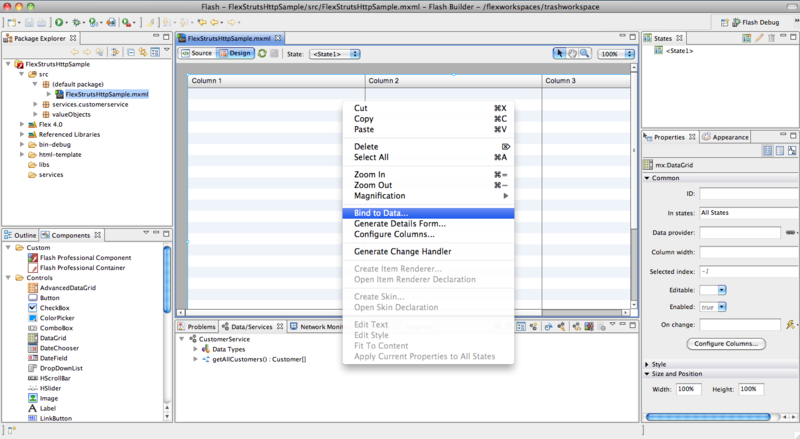 Flash Builder will create a new project along with a default application file called FlexStrutsRemotinSample.mxml. Flex framework has a class called RemotObject using which you can consume Remoting services i.e invoke methods in Java class on the server. You can manually write code to send the request or alternatively act smart and use the Data Centric Development (DCD) feature in Flash Builder 🙂 Flash Builder can generate the code to send request to the server to get the data, lets see how. Select BlazeDS and click on Next. Flash Builder will display a window asking for RDS credentials. Since we turned off security for our RDSServlet by setting the useAppserverSecurity parameter to false in the web.xml, select No password required and click on OK to continue. You can see that Flash Builder listed all destinations exposed in the screen below. In this screen we are selecting the destination the newly created service should use. All destinations available will be displayed. 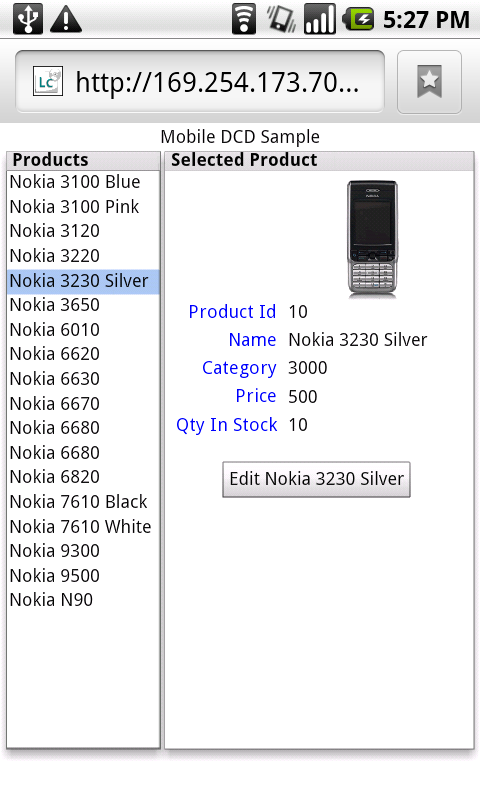 Select a destination (CustomerService in this sample) and click on Finish to continue. Code for invoking the Remoting service will be generated, you can see the service and its operations (methods exposed by the Java class) being displayed in the Data/Services window and the source code for the same in the package explorer. Flash Builder 4 introspects return types for the Java class methods and creates AS3 classes for any custom Java classes. 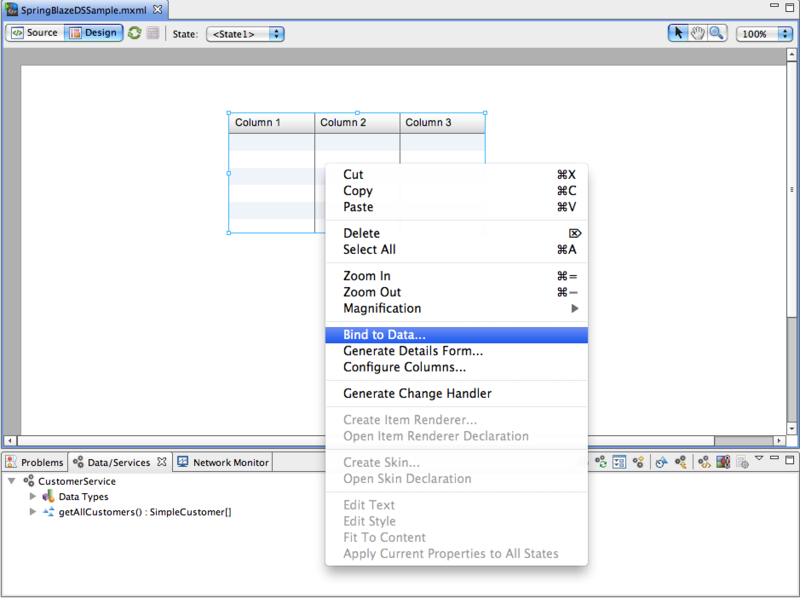 Switch to design view and drag and drop a DataGrid component as shown in the image below. A window as shown in the image below will be launched. Select New service call because there are no existing services in the current application. Select CustomerService from Service list. You can see the DataGrid with columns added for each property of the SimpleCustomer class in the design view as shown in the image below. Save and run the application. 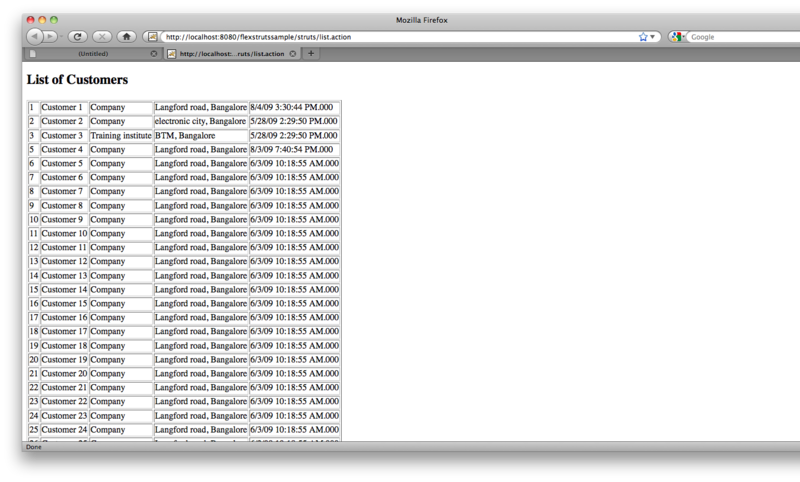 You can see application with data retrieved from the server and displayed in the DataGrid as shown in the image below. This article explains how to add Adobe Flex front end to Java + Struts web application. 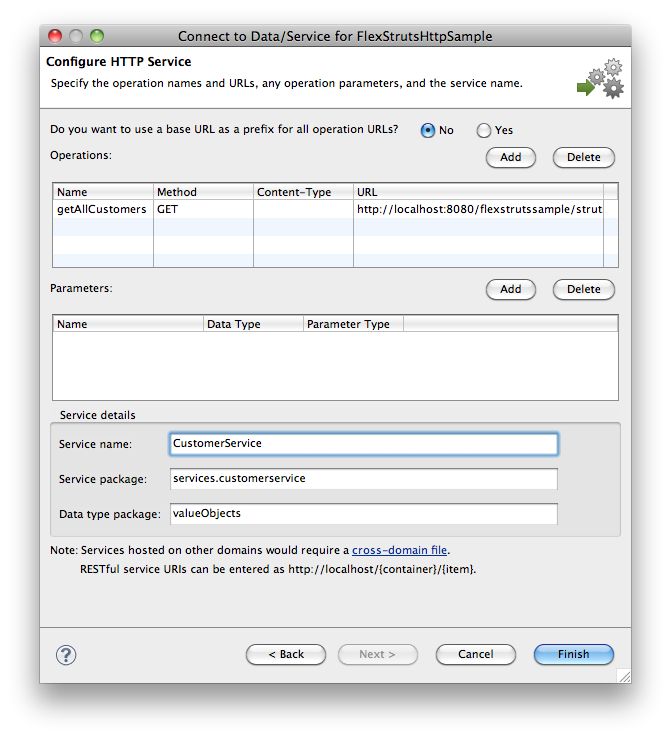 In this article we will be using HTTP Service to communicate with the server from Flex application. Sample in this article uses Flex 4 and Struts 2.1.8. 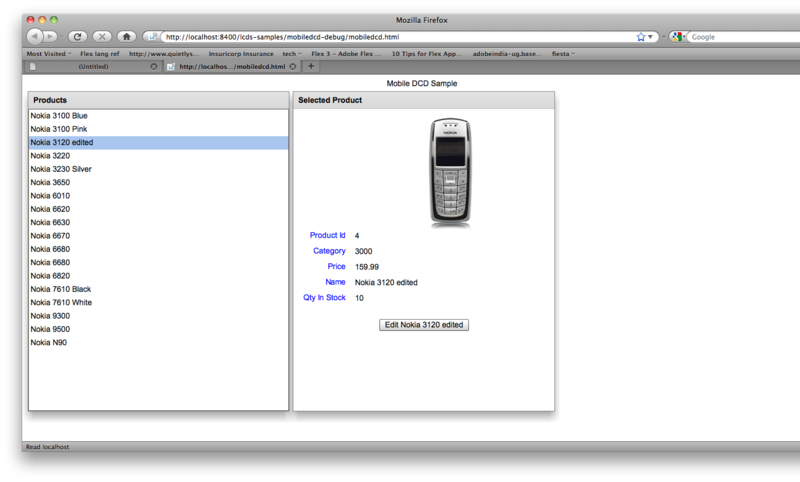 First lets have a look at Java + Struts web application which uses HTML to display the data. I have a class called SimpleCustomerService, which has methods to communicate with Database and perform CRUD operations on the Customer table. In this article we will use the getAllCustomers() method in SimpleCustomerService class, which returns all the Customer entries in the database. I also have CustomerAction class that extends from ActionSupport class. 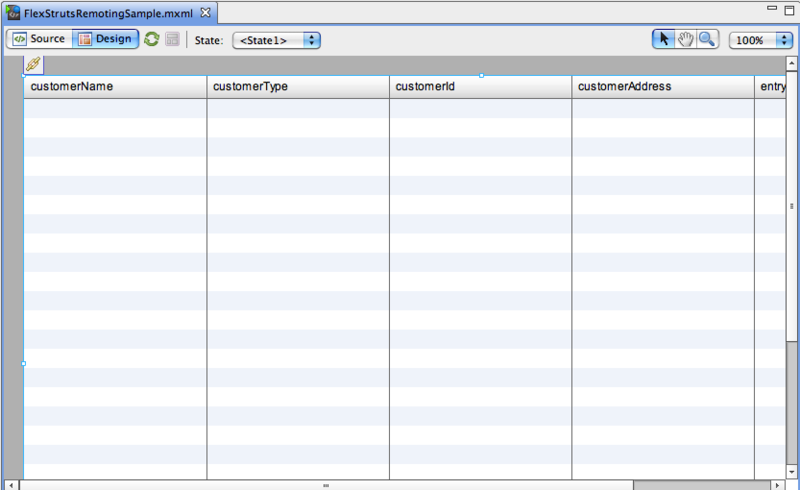 CustomerAction class invokes the getAllCustomers() method in SimpleCustomerService class and returns Action.SUCCESS. In the Struts configuration file (struts.xml) we have the result “success” mapped to list.jsp for the action with name=”list”. If you observe list.jsp is returning HTML, so that browser will render the data in a table. Since we will be using Adobe Flex framework to create the user interface for the application, we don’t have to return HTML from the server. All we need to return from the server is the data that has to be displayed; this data can be represented in any format like XML or JSON. Lets change the Struts configuration file to add another action node whose “success” is mapped to a different JSP page, which returns XML data instead of HTML. The listasxml.jsp returns the list of customers as XML. 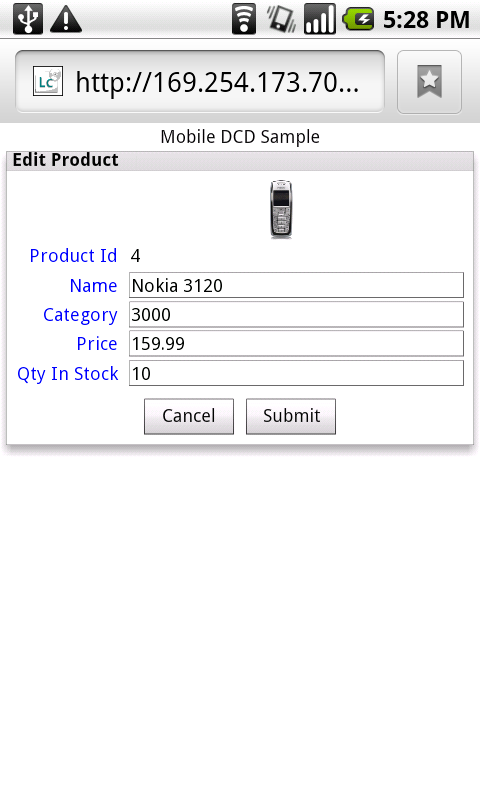 Now that u have the list of Customers returned as XML from the server, creating a Flex application is very easy. 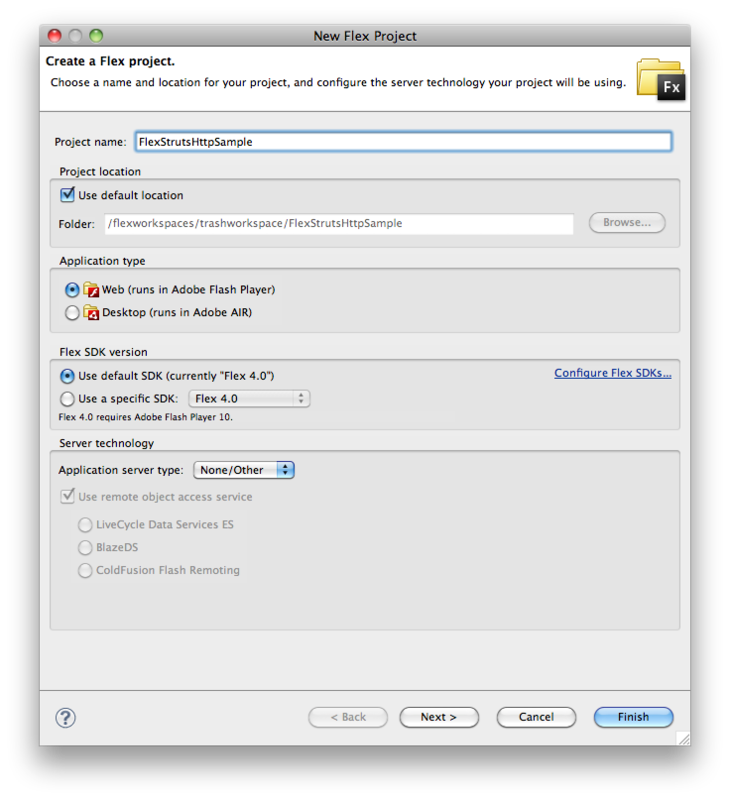 Flash Builder will create a new project along with a default application file called FlexStrutsHttpSample.mxml. 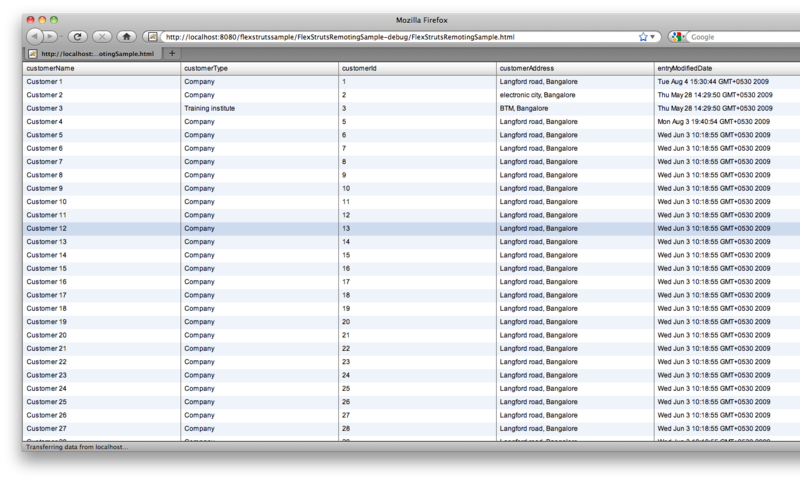 To get the list of customers from the server we need to send a request to listasxml action configured on the server. Flex framework has a class called HTTPService using which you can send HTTP GET request to invoke listasxml action to get the customers in XML format. In this window you can select the type of service you want to connect to. We need to connect to a HTTP service, select HTTP and click Next to continue. For each service there will be an Action Script class generated and for each operation of the service there will be a function generated inside the class. A service can have any number of operations. Each operation has an URL associated with it, when the respective function is invoked a HTTP request is sent to the corresponding URL. We will create a service and an operation to consume the data from the listasxml action/jsp. A service named CustomerService will be created and listed in the Data/Service panel (services explorer) as shown in the image below. 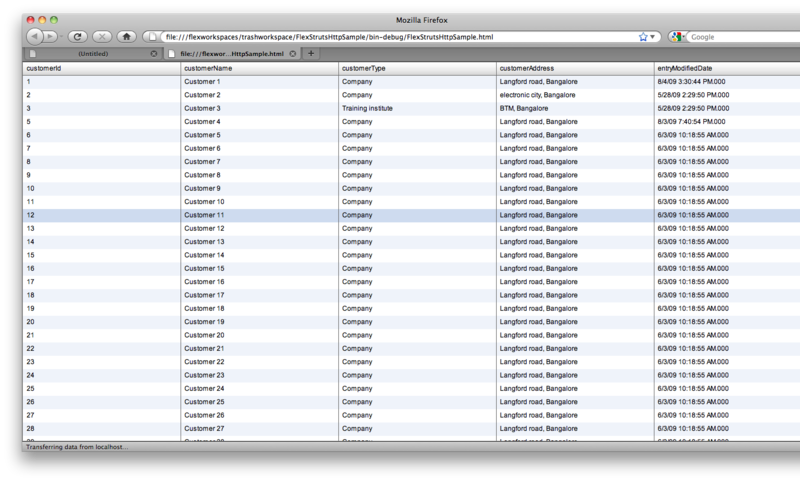 You can view the source code files for the CustomerService.as in the package explorer. 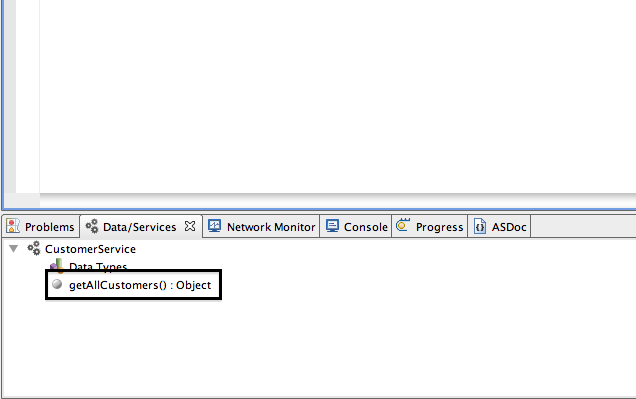 We will configure service operation to create Action Script classes when the XML data is returned from the server. This will make coding easier, since it is easier to deal with strong typed objects than parsing the XML data. 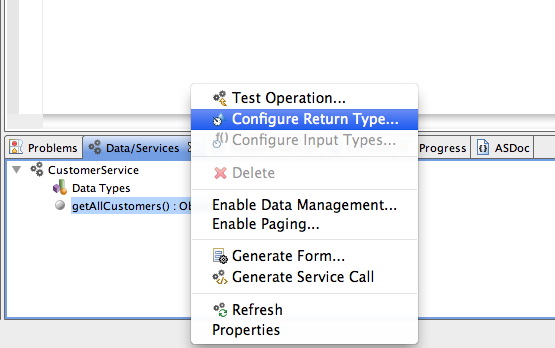 Right click on the getAllCustomers operation in the Data/Services panel and select Configure return type as shown in the image below. 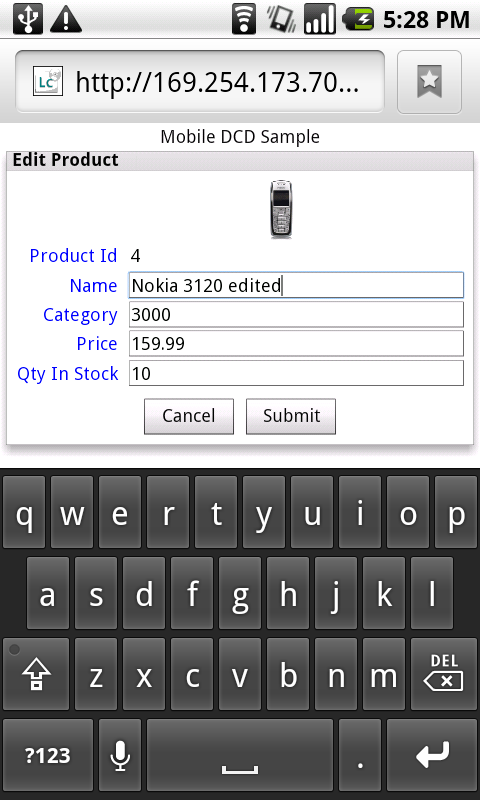 A window as shown in the image below will be launched with options to configure the return type. 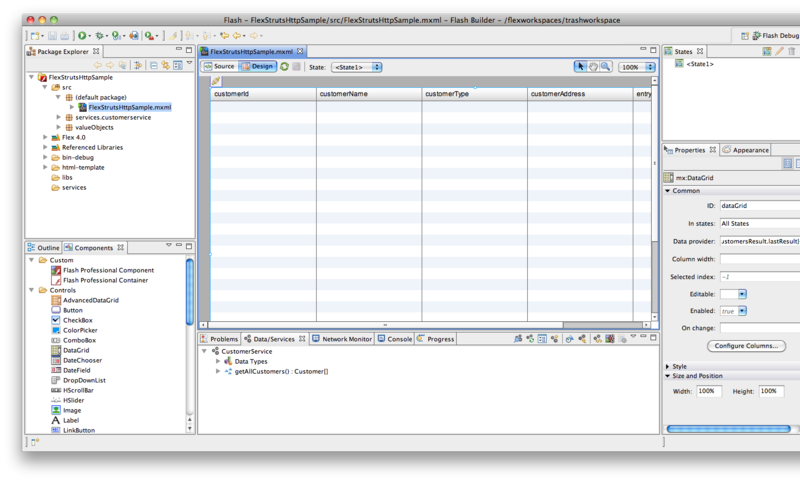 You can chose an existing data type or let the Flash Builder generate VO classes based on the response from the server. Let’s leave it to the Flash Builder to generate required VO classes based on the server response as shown in the image below. Click Next to continue. 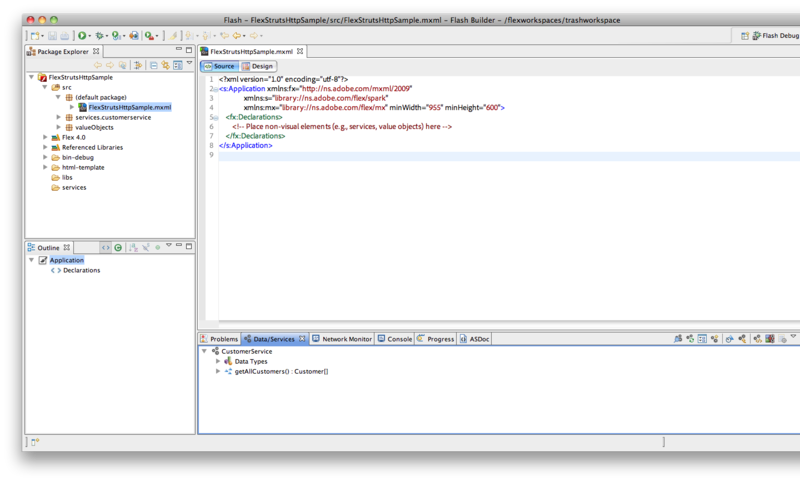 Flash Builder will display a screen as shown in the image below, where you can enter the parameters to be passed to the server along with the request. We don’t have to pass any parameters in this step. Flash Builder also allows you to give sample response rather than sending a request to the server to get the data. This will be useful when the server side code is not ready but you want to continue creating the Flex application without waiting for the service to be created. Since we have the service ready in our case, let’s send a request to the server and configure return type. Click on next to continue. Flash Builder parses the XML data returned by the server and displays the same as shown in the image below. You can select the XML node based on which you want the return type AS3 class to be generated. You can see the return type of the operation in the Data/Services panel changed as shown in the image below. When we invoke the getAllCustomers() function, an Array of Customer type objects will be created based on the XML response from the server. We usually write code to display the response from the service in a DataGrid or any other control. Flash Builder 4 has an awesome option, which allows you to easily bind a service operation response to a control. 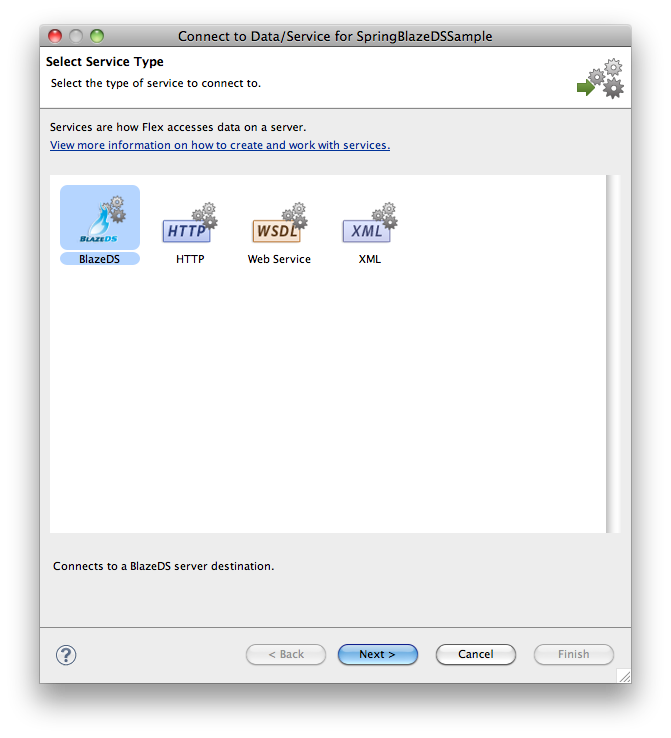 Select “New service call” because there are no existing services in the current application. 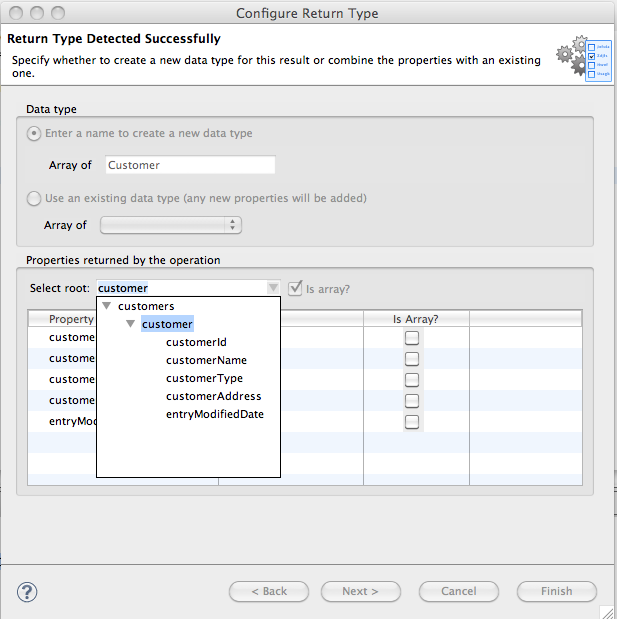 You can see the DataGrid in the design updated its columns to display properties of the Customer object as shown in the image below. Save and run the application, you can see the data retrieved from the Remoting service and displayed in the DataGrid as shown in the image below. Data Centric Development (DCD) in Flash Builder 4 allows developers to build Flex front end for any back-ends very easily. 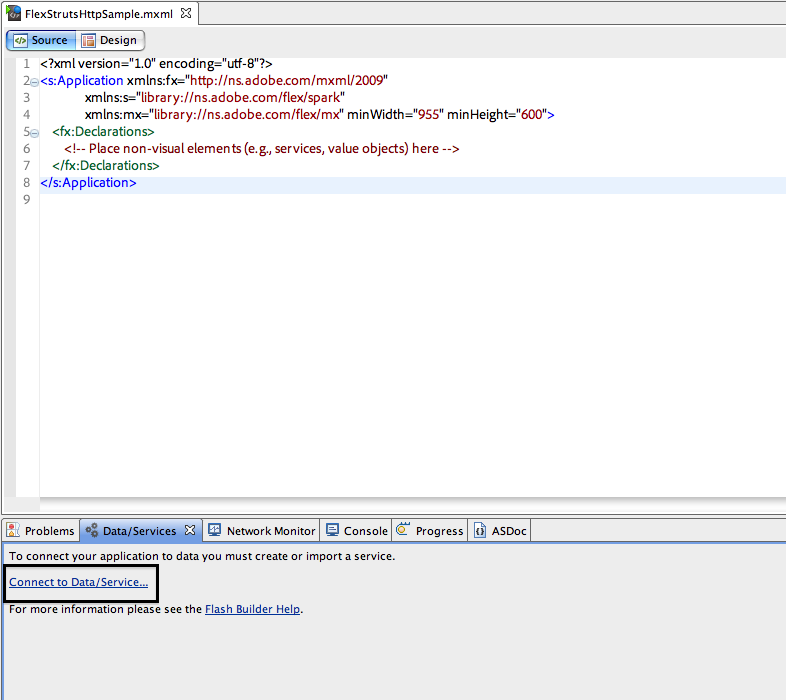 Spring BlazeDS project from SpringSource makes it easier to create spring powered Rich Internet Applications using Adobe Flex. 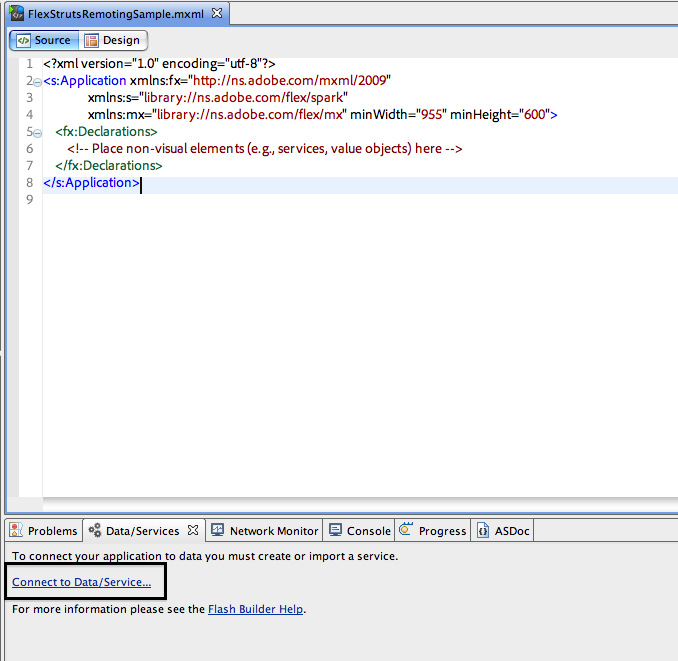 In this article we will see how we can use Adobe Flex, Flash Builder 4, BlazeDS, Spring, Spring BlazeDS and Java to create Rich Internet Application. Lets start with setting up web application on the server. Start by creating a web application name springblazedssample. You can do that by creating a folder named springblazedssample under your web server document folder. 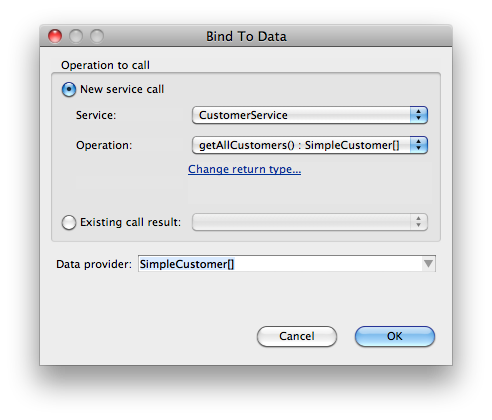 In this sample we will use SimpleCustomerService.java and SimpleCustomer.java. We will configure SimpleCustomerService as spring managed bean and expose the same as Remoting Service to consume from Flex application. Download web-application-config.xml from here http://sujitreddyg.com/fb4articles/springblazeds/web-application-config.xml Place web-application-config.xml in your web application folder under springblazedssample/WEB-INF/config folder. We configured BlazeDS Message Broker Servlet as spring managed bean using <flex:message-broker/> tag. We exposed SimpleCustomerService bean (id=CustomerService) as BlazeDS Remoting Service destination by adding <flex:remoting-destination/> tag. Download the Java class files used in this sample from here http://sujitreddyg.com/fb4articles/springblazeds/javaclasses.zip. You will be downloading a file named javaclasses.zip. Extract javaclasses.zip into a folder named javaclasses and copy folder named com under javaclasses into your web application folder under springblazedssample/WEB-INF/classes folder. We have our server environment setup; lets create Flex application, which consumes SimpleCustomerService exposed as Remoting service destination. Create new Flex from File -> New -> Flex Project menu. Set the Root URL to root URL of your web application. Its http://localhost:8080/springblazedssample in this sample. 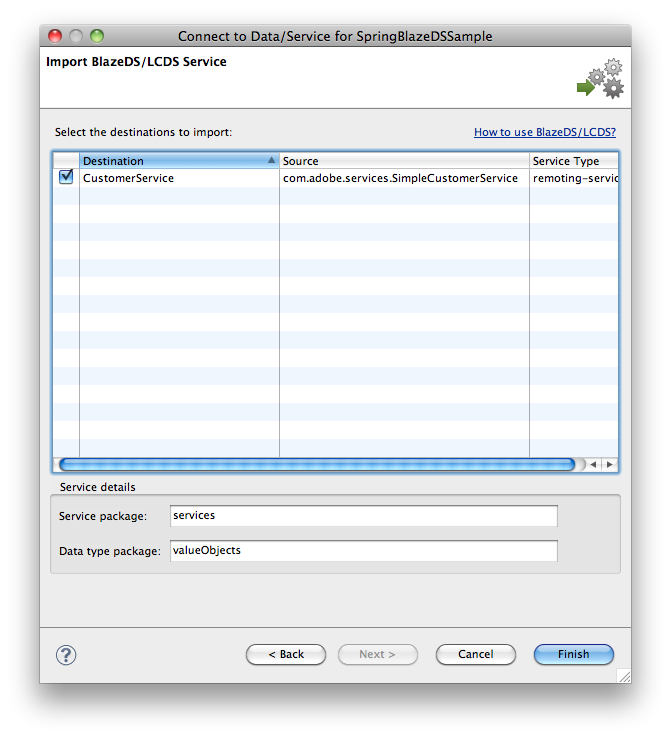 Set the Context root to context root of your BlazeDS enabled web application (springblazedssample). Leave the output folder to default value. 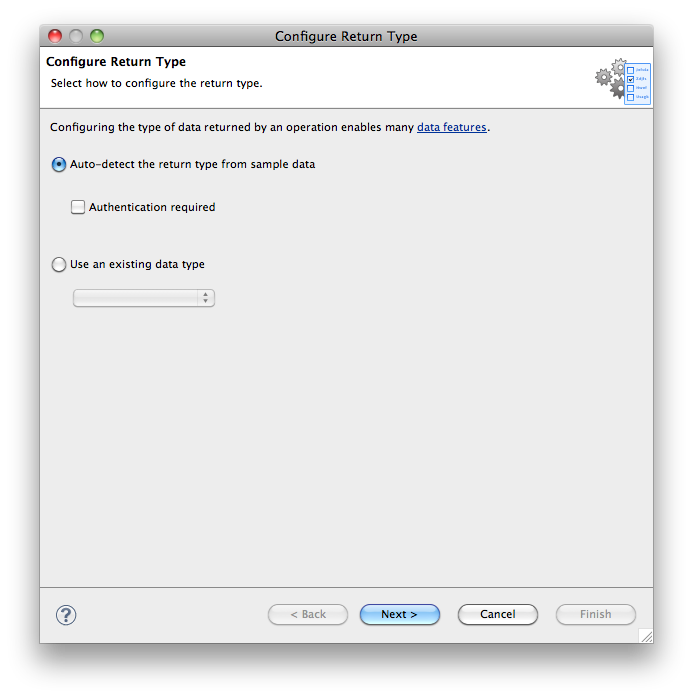 Click on validate configuration button and see if the configuration is valid. DCD or Data-Centric Development is one of the advancements to the Flash Builder 4. Let’s see how easily we can create a Flex application that consumes BlazeDS Remoting service (SimpleCustomerService) using DCD. Select BlazeDS and click on Next. 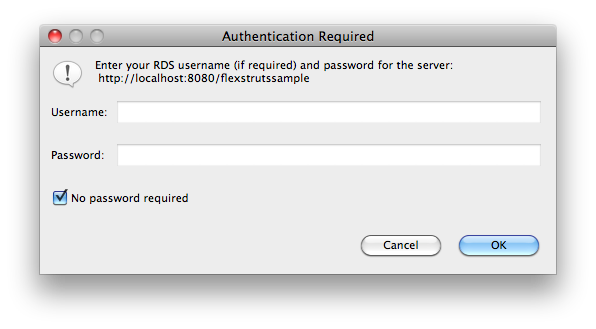 Flash Builder will display a window asking for RDS credentials. Since we turned off security for our RDSServlet by setting the “useAppserverSecurity” parameter to “false” in the web.xml, select “No password required” and click on OK to continue. You can see that Flash Builder listed SimpleCustomerService bean exposed as Remoting Service destination using <flex:remoting-detination/> tag. Similarly any other Remoting service destinations will be listed here. Select a destination (CustomerService in this sample) for which you want the code to be generated and click on Finish to continue. Code for invoking the Remoting service will be generated, you can see the service and its operations (public methods of the Java class) being displayed in the “Data/Services” window in the image below and source files for the same in Flash Builder package explorer. Flash Builder 4 introspects return types for the Java class methods and creates AS3 classes for any custom Java data types. Other than generating code to consume services from Flex applications, Flash Builder can also generate code to bind the service result to a UI component. 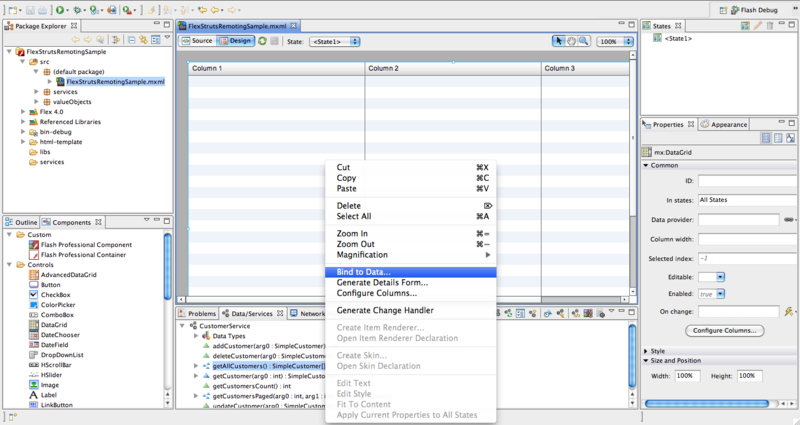 Switch to design view and add a DataGrid component as shown in the image below. Select the DataGrid. 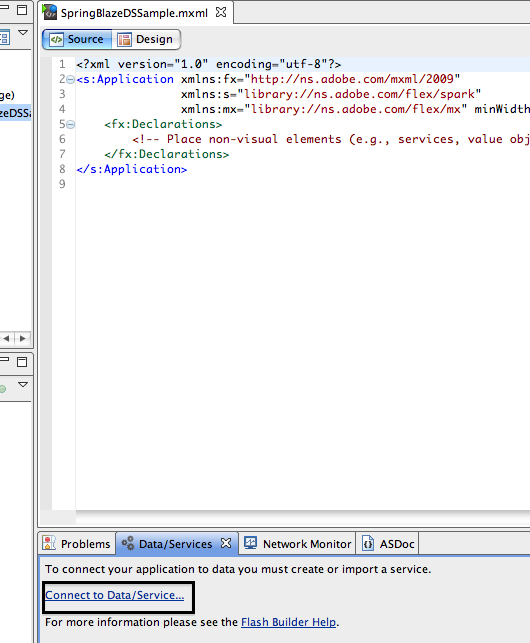 Right click on the DataGrid and select “Bind to Data …” as shown in the image above. A window as shown in the image below will be launched. Select “CustomerService” from the list of services. Select “getAllCustomers():SimpleCustomer” from the operations list. Select SimpleCustomer as Data Provider. 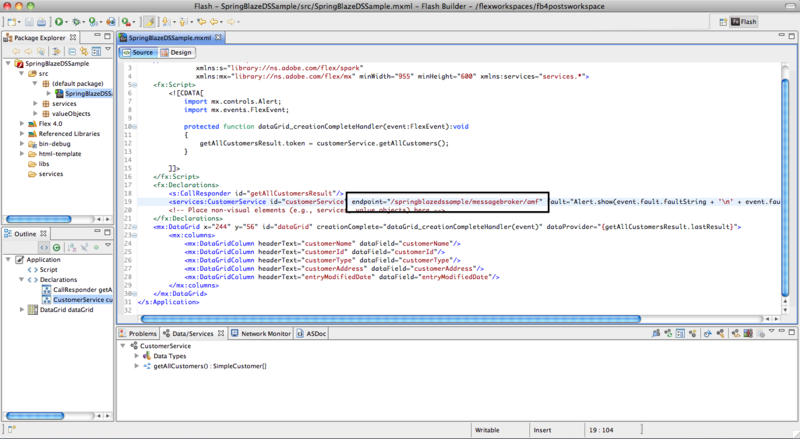 Switch to code view and set the endpoint property of the CustomerService (CustomerService instance added to SpringBlazeDSSample.mxml) to /springblazedssample/messagebroker/amf as shown in the image below. Save and run the application. Your application will invoke the getAllCustomers() method in SimpleCustomerService class on the server and displays the returned data in the DataGrid as shown in the image below. I updated my article on Flash Builder 4 for the release version. You can find the complete list here https://sujitreddyg.wordpress.com/flash-builder-4/. Developed a simple Flickr search application using Flex 4, targeting Flash Player 10.1 on Google Nexus One. This application lets users search for photos on Flickr and uses the API provided by Flash Player 10.1 to handle touch events. Details on Flash Player 10.1 API for touch, multitouch and gestures can be found in Flex Developer Guide. Also read Multi-touch and gesture support on the Flash Platform by Christian Cantrell and Flex 4 List Scrolling on Android with Flash Player 10.1 by James Ward. The application developed here is consuming data from a Data Management Service destination of LiveCycle DS (LCDS) and so any changes to the data on the mobile devices is pushed to all other clients viewing the same data 🙂 In the last image below, you can see the changes made on the mobile being pushed onto the application running on Mac. You are currently browsing the archives for the Flash Builder 4 category.